Intraductal Papilloma and More: Section 4.c. Columnar cell lesions occur in the terminal duct lobular unit (TDLU) and are associated with intraluminal secretions and micro-calcifications. They carry a low risk for the subsequent development of breast cancer (relative risk about 1.5). Terminal duct lobular unit, sounds like something you’d find at an airport. Speaking of flying, have you noticed, the strength of the turbulence is always proportional to the temperature of your coffee. Type 1 (columnar cell change, CCC): 1-2 cell layers. Columnar cells with uniform ovoid, elongated nuclei perpendicular to the basement membrane; may have apical snouts but usually not prominent. Type 2 (columnar cell hyperplasia, CCH): > 2 stratified cell layers with variable nuclear crowding and cellular micropapillations, but no complex architectural patterns (i.e. no rigid bars, bridges or well-formed micropapillary structures); cytology similar to Type 1 but may have ‘hobnail’ cells. Two blood cells met and fell in love but alas it was all in vein. Type 3 (columnar cell hyperplasia with architectural atypia): > 2 stratified cell layers with complex architectural patterns (micropapillary, tufts, fronds, arcades, rigid bridges or punched out spaces); type 2 cytology. Type 4 (columnar cell hyperplasia with cytologic atypia): type 2 architecture; mild to moderate cytologic atypia, may resemble tubular carcinoma. Type 5 (columnar cell hyperplasia with cytologic and architectural atypia): type 3 architecture; type 4 cytology. Type 6 (columnar cell change with cytologic atypia): 1-2 cell layers; type 4 cytology. I have never heard of this ‘columnar cell change’ before. Columnar Cell breast lesions are more of a concern for breast cancer researchers than women in the general population, even those undergoing breast cancer screening. Looks like a big pink squid’s tentacle to me. Ha Ha, how many tickles does it take to make a squid laugh? Ten-tickles! Columnar cell change is a form of metaplasia where replacement of one specialized cell type, the breast epithelial cells, is by columnar glandular cells. When columnar cells replace the epithelium of the ducts or lobules, there may be micro-calcifications. For this reason, columnar cell lesions are recognized more often, due to the mammographic screening program. Proliferation of glandular cells lined by columnar cells is termed ‘blunt duct adenosis.’ The new terminology for this change is ‘columnar alteration with prominent apical snouts and secretions’ (CAPPS). Columnar cell change (CCC) without atypia, is also termed columnar cell hyperplasia (CCH). When there is cytological atypia of the columnar cells, the lesion is termed flat epithelial atypia (FEA). Who recognizes FEA as a distinct category? Not who Moose, The Who, The World Health Organization. FEA is associated with secretions and intraluminal micro-calcifications and for this reason it can be detected by radiology. 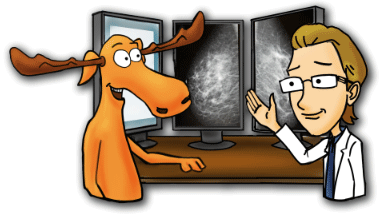 The mammographic breast screening program has brought this condition to the attention of Radiologists and Pathologists. On histology, FEA is characterized by several layers of cuboidal to columnar cells without cell polarity, showing round, uniform nuclei. Cellular tufts may be present. Clinical management of these low-risk lesions is dependent upon careful radiological and pathological correlation. Flat epithelial atypia (FEA), or ‘columnar cell change with atypia,’ or ‘clinging carcinoma’ of the monomorphic type, is diagnosed on breast biopsies performed for micro-calcifications that are found on screening mammograms. Flat Epithelial Atypia (FEA) is usually identified from a core needle biopsy (CNB) and is present in under 2 % of core needle specimens. The clinical significance of FEA is difficult to assess given the multiple names and definitions over the years. Several studies have shown that FEA is associated with DCIS or invasive cancer, specifically tubular or lobular carcinoma. There are several cytological and genetic similarities between FEA, DCIS, and tubular carcinoma. These observations suggest that some FEA represent a precursor lesion to low-grade DCIS or possibly tubular carcinoma. When a woman is diagnosed with Flat Epithelial Atypia (FEA) alone on excisional biopsy, she can return to routine surveillance, including regular mammograms and breast examination. The risk of breast cancer associated with FEA is equivalent to benign proliferative disease without atypia; there are no data as yet to support the use of risk-reducing therapy on the basis of FEA alone. Flat Epithelial Atypia (FEA), that section is all a bit confusing for me, I’m afraid. Yes, I can see why. The vast majority of these lesions are considered benign and the clinical significance of them is still under debate. So what would you do if you were diagnosed with Flat Epithelial Atypia? It’s just some cell changes really. Keep healthy and get regular breast screenings. The benign intraductal papilloma originates from the ducts in the sub-areolar region or the peripheral duct system. Intraductal papilloma can be solitary or multiple. The intraductal papilloma is characterized by a fibrovascular core covered with epithelial and myoepithelial cells. Central intraductal papilloma with a predominant glandular differentiation are called ductal adenoma. Intraductal papilloma and ductal adenoma may show a variety of changes including sclerosis, epithelial and myoepithelial hyperplasia or squamous or apocrine metaplasia. This variety of changes seen in benign papillomas causes diagnostic difficulty in the histological analysis of core needle biopsies (CNB). In the 2012 WHO classification, the old term of ‘papillomatosis’ is no longer used. ‘Papillomatosis’ was used in the past for usual-type ductal hyperplasia (UDH) and benign intraductal papilloma. Remember ladies, never go to bed angry. Stay awake and plot your revenge. biopsy taken from a patient with breast duct obstruction. That looks like a beautiful snowflake to me. Yes, some of these pictures are really pretty. Hmphhh Girls! Seriously, it looks like the family crest of an ancient warlock. Atypical epithelial proliferations (ADH and DCIS) may occur in intraductal papilloma, but they are usually of low grade. The distinction of ADH and DCIS within a papilloma relies on quantitative criteria. An intraductal papilloma with ADH is diagnosed when the atypical epithelial proliferation is < 3 mm. Attention Deficit…Horse, did you see that horse? It actually stands for Atypical Ductal Hyperplasia. It’s a non-cancerous, abnormal pattern of cell growth. Larger atypical epithelial proliferations (>3 mm) within a papilloma fulfill the criteria of an intraduct papilloma with low-grade DCIS. According the 2012 WHO criteria, the definition of intraductal papilloma replaces alternative terminologies that were focused on the proportion of atypical cells (30% to 90%) within a papilloma. An intermediate-grade or high-grade DCIS within a papilloma can now be diagnosed regardless of the extent of atypia. Intraductal papillary carcinoma is an architectural pattern of Ductal Carcinoma in Situ (DCIS). It must be clearly distinguished from benign or atypical papillomas. Intraduct papillary carcinoma can occur with other patterns of DCIS, such as cribriform or micropapillary patterns. Comedo necrosis is uncommon with intraduct papillary carcinoma. Histologically, intraductal papillary carcinoma is usually unrelated to the presence of intraduct papilloma and is not thought to arise from papillomas. ‘Comedo necrosis’ that sounds gross! Necrosis refers to cells that are dying. When cells die they often attract other chemicals in the body and form something called ‘comedo necrosis,’ which is basically the residual, leftover dead cells. The name for the larger type of the former ‘intracystic papillary carcinoma‘ has changed to ‘encapsulated papillary carcinoma’ because of the fibrous capsule that surrounds these lesions that usually lacks a myoepithelial cell layer. An encapsulated papillary carcinoma may represent an in-situ lesion or an ‘indolent’ form of invasive papillary carcinoma; this has not been resolved. The diagnosis of invasive carcinoma is made if invasion is present outside the fibrous capsule. Encapsulated papillary carcinoma should be staged as papillary carcinoma in-situ if there is no invasion, and has an excellent prognosis. Excellent prognosis, now there’s something I like to hear, as do all the ladies looking up Encapsulated Papillary Carcinoma. Another form of well-circumscribed, rarely invasive papillary carcinoma is ‘solid papillary carcinoma.’ This tumor is composed of multiple adjacent nodules. The papillary nature may not be apparent because of its predominantly solid growth pattern. Diagnostic criteria for solid papillary carcinoma include the presence of small, monotonous cells with hyperchromatic cell nuclei. These cells may show neuroendocrine or mucinous differentiation. The prognosis of solid papillary carcinoma is good; when a myoepithelial cell layer surrounds the tumor, it is classified as an in-situ carcinoma. I was going to tell a joke about amnesia at the end here, but I’ve forgotten how it goes.